Few case studies to get you all inspired (...and call us). FOUNDERS FORUM CASE STUDY: Been going for 11 years now as a company? How about telling your story on a 18m wall and letting your guests and team explore important facts presented in a visual way through the years literally by walking through the corridor and exploring each time something new. getting those online impressions & engagement sky rocketing! 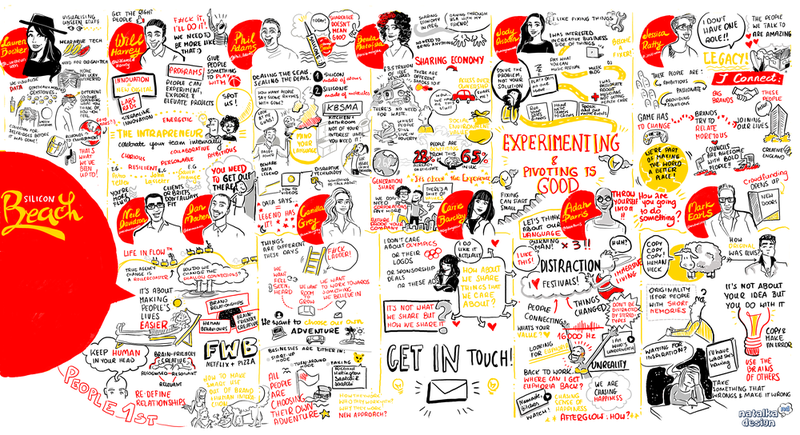 SILICON BEACH CONFERENCE CASE STUDY: Graphic facilitation is what can help your event's visibility massively. Have a look above at some of the tweet stats and the kind of boost in impressions and impact sharing these visuals from talks can give. Also it's a visual creative content to share after the event to keep the momentum going and speakers + sponsors love it and share it too. We also draw the sponsors and make sure the event shares a thank you to them too (they love it and re share ...it's more powerful than just a thank you and logo on a slide) Graphic recording can genuinely increase the visibility and love around your event. MAXUS GLOBAL CASE STUDY: There's a lot of ways to make a pitch memorable and impactful. But only the bold and different ideas win. How do you stand out when many other companies offer similar approach? Hmmm... How about we invite the client to your space and ... paint the pitch on the wall so you can literally walk them through it and help them buy into the concept? Why not :) This one definitely goes into an 'unforgettable bucket'. BLACKBULLION CASE STUDY: Want to quickly explain what you do but text is not engaging enough, you talking about it can be forgotten or need to showcase what you do to more than one person? Let's make a video about your story which will make your life and everyone else's around you much easier. Who said a team photoshoot has to be boring? We've been asked many times to deliver a team photoshoot and that's great - we can do that! But we like to have fun and always think of new ways to create. We came up with Photo Doodles: photos + doodles. We ask people to do whatever they feel like doing, put some music on and voila! Their own little words unfold and suddenly the usually same type of project becomes a whole new ball game. THE LONDONER BLOGGER CASE STUDY: Life is quick, we get from one to another point in no time and stop reflecting for a moment. If only there was a tool that can always act as a guidance, focus point, a positive reminder of what's great in your life and a anchor to guide us through better and worse times. A personal mood board can do the trick. All the things that matter to you on 1 page. Something that will help you reach your goals, motivate and inspire for your next steps. Wether that's for you, your friend, whole family or team - a visual representation of what matters to you, will work like a dream. HENDERSON CASE STUDY: How do we get people hooked in...how do we make them stop and look, we've got only few seconds to capture that attention. Pictures? Moving pictures? Looking at someone draw the entire story through pictures? You've got my attention. smile - you're on camera!